Blogging About The Web 2.0 Connected Classroom: Let's Make Professional Learning Meaningful Again! Let's Make Professional Learning Meaningful Again! The worst professional development session I have ever delivered. It had already been a long week. And this was the last session I was delivering. The participants could tell that this was the last place I wanted to be and really it was the last place they wanted to be too. I trudged through the scripted content with little passion. They asked questions because they thought they had to in order to move things along and I answered with one word or two. As everyone was getting up to leave I noticed one person didn’t get up. In fact he wasn’t moving at all. Great, my PD was so boring I’ve killed someone. Fortunately he was just asleep. But still. He was so disengaged that sleeping was a better alternative. I know this is an extreme example but this type of PD happens all the time. Just ask the teachers in Chicago Public Schools. The fact is, educators have to sit in terrible professional development all the time. Either because there is a true lack of understanding of what goes into the needs of educators when it comes to their learning or like my example, it’s just plain boring. Many, if not all educators, are familiar with pedagogy, or the theories related to learning and teaching children. Andragogy are the theories related to teaching adult learners. These are two totally different concepts and the ways that kids learn differ from adults. Yet if we look at the way PD is designed it often neglects the needs of adult learners. I have the opportunity to take part in, observe and deliver hundreds of hours of professional development a year, either through conferences, meetings or during the work I do. Sometimes I am lucky and I get to sit in with someone who has a passion for what they do and it shows during our time together. Other times I see PD delivered to teachers that is much like the kind in the video from Chicago Public Schools, boring, scripted and participants that are disengaged. We would never stand for teaching kids this way. Why do we not take a stand when it comes to our own professional learning? Professional development comes in all forms and can be delivered in a multitude of ways. But I believe there are 3 things for us to remember when it comes to any type of professional development or professional learning. Keep It Simple: Professional development that is overly complex and over-planned tends to lead to disengaged learners. Limit the focus of professional learning to one or just a few concepts at a time. I am an advocate of depth over breadth in the professional learning rather than the “one and done” or “6000 Tools in 60 Minutes” type sessions. With a concentrated focus, learning can include application, collaboration, and evaluation. Adult learning theory tells us adults need to have their voice as part of the conversation within the first six minutes of the learning to promote engagement. When we keep things simple, more time is available to hear those voices, provide choice in learning path and better understand the needs of all learners to cultivate a more meaningful professional learning experience. Keep things simple and build in time for exploration, conversation and tangents. Reflect, Reflect, Reflect: As a PD leader what I do is never perfect. There is always room for improvement. One of the tenets of instructional design theory is taking time to reflect on what works and what does not. By keeping it simple, and having that concentrated focus we get the opportunity to take a step back to determine what is going well or what changes to the instruction are needed. What is working? What isn't? What do we need to cover again? What would I do differently the next time? Is there someone who needs some extra help? Educators need time to think about how a new tool or learned skill fits into their classroom and with their kids. Even if we believe what we are presenting is an easy concept to master there has to be some time for reflection. Adult learning theory tell us that educators want that tie back at the end of a learning session to goals and objectives laid out in the beginning. They also need direction in their thinking for afterwards. We want to have them leave thinking about what we want them to be thinking about. Giving opportunities during and after PD for reflection can help solidify the learning we ultimately want them to walk away with. For leaders, time absolutely needs to be taken to look at the session as a whole. During the session temperature checks and informal formative assessments (simple feedback questions or times set aside to see where learning is) are critical to ensuring that the learning is on the right track. And afterwards take a look at what went well, and what could have been better? Solicit feedback from individuals and use those comments as opportunities to build even PD the next time. Play: Look back at those teachers taking part in the PD from Chicago Public Schools. I have a hard time believing that providing an opportunity to play entered in at any part of their day. For professional development to be truly effective individuals need to be invested in their learning. And it’s hard to deny that when one is having fun they are engaged. Build in time for exploration and play, especially when it comes to Edtech or technology PD. Educators need time to digest and experiment (guided practice) with the tools they are learning. Look at BreakoutEDU and how they are redefining how PD is done. Learning is fun again! Professional development is an important part of the learning process for all educators. 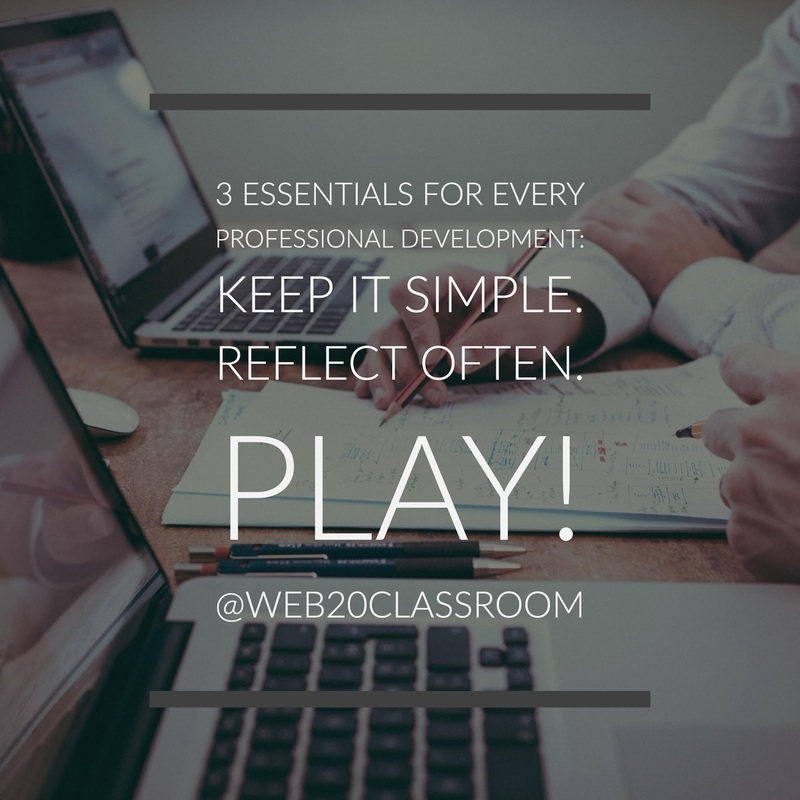 More time and attention needs to be given on crafting PD that is simply designed, utilizes reflection as part of the growth process and lets everyone play a little more. As we head into another school year let us all, educators and professional development leaders alike, resolve to make professional learning meaningful again.